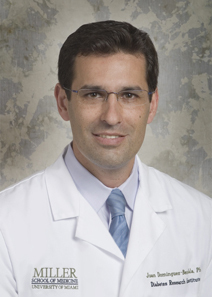 Dr. Juan Bendala is currently working as Research Associate Professor in Diabetes Research Institute, University of Miami School of Medicine, Miami, FL, USA. Dr. Juan Bendala attained his doctoral degree from Roslin Institute/Edinburgh University, Edinburgh, UK, with the theme “Manipulation of gene targeting frequency in mammalian cells”. Dr. Bendala has authored many paper publications, abstracts and posters. He is also member of Editorial Board- World Journal of Stem Cells and Reviewer for Journal of Clinical Investigation, Cell Transplantation, American Journal of Transplantation, Cloning and Stem Cells, Stem Cells, Cell Preservation Technology. Dr. Bendala is also Reviewer for NIH: IAR Reviewer 2009/10 ZRG1 BDA-A (58) R - Center for Scientific Review Special Emphasis Panel; NIH: 2010/10 ZRG1 ETTN-G (14) B – SBIR Aging and Development section; New York State Stem Cell Science (NYSTEM) Stem Cell Reprogramming Panel (2009) and Reviewer, NIH: Beta Cell Biology Consortium Targeted Resource Generation Projects (TRGP) (2012). He is member of Medical Science Review Committee (MSRC) for the Juvenile Diabetes research Foundation (JDRF) Replacement and Regeneration Innovative Awards (2009). Dr. Bendala's research focuses on Diabetes, stem cells (embryonic and adult), pancreatic development, regeneration, reprogramming.